Corn is a large grain plant first domesticated by pre-Columbian peoples in South America and was imported in Europe after 1942, when Christopher Columbus discovered the new world. In Italy, this cereal is cultivated mainly in the North, giving birth to the “Civiltà della Polenta” (“Civilization of the mush”), together with some minor cultivations such as millet, barley and buckwheat. Nowadays people in mountain areas of Northern Italy still consume corn as a tradition, whereas cereal cultivation has always been predominant in the South, as weather conditions are more advantageous and the land is more suitable for sowing. The first types of mush made of durum wheat, farro and legumes like green beans used to be seasoned with vegetables and pork. Corn, also known in dialect as randinje, is present in the ancient recipes of Abruzzo’s culinary tradition with pizza or focaccia “de randinje”, a soft corn wheat dough, water and salt, just like the typical mush “all’abruzzese”, which differs from the one of the North in consistency of corn flour and is prepared with meat sauce, sausages, pork cuts, bacon and Farindola pecorino cheese, or with legumes in the “white” version. 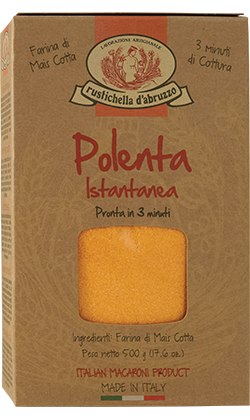 Ready in just 3 minutes, Rustichella d’Abruzzo Polenta Istantanea is just perfect for everyone, no matter what season it is, whether summer or winter! Try it in the classic recipe with meat (or liver) sausage, our PrimoGrano “Pomodoro a Pera d’Abruzzo” sauce and Pecorino cheese. Otherwise, once cooked, chop it into small cubes and serve it as starter with grilled vegetables, a bit of PrimoGrano INTOSSO monocultivar extra virgin olive oil and Pecorino cheese. Your palate and senses will be delighted for sure! 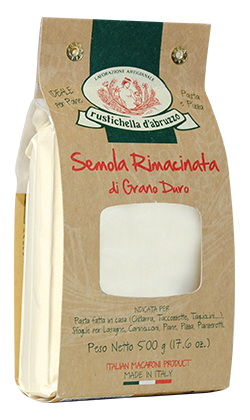 By further milling Rustichella d’Abruzzo durum wheat semolina, which contains a high amount of proteins, it is possible to obtain re-milled semolina, a typically amber-coloured product with very narrow diameter. It is used mainly for making bread and pizza, perfect also as dough for fragrant homemade biscuits, as the ones that used to be made in the past. 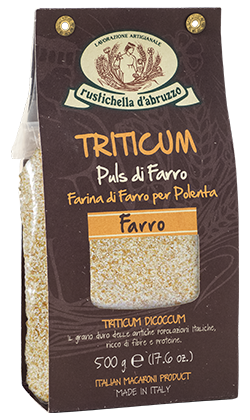 Rustichella d’Abruzzo Farro Flour for Cornmeal Mush (aka Farro Puls), is obtained by milling TRITICUM DICOCCUM farro of our fields, which are controlled from the sowing to the harvest. In fact, the company Rustichella d’Abruzzo pioneered the process of the controlled production chain, starting in 2004 with the project called “PrimoGrano”, when the possibility of controlling cultivations from sowing was still under discussion in Abruzzo. Try it for making a farro mush with vegetables, cheese and cured pork meats, or combining it with our PrimoGrano “Pomodoro a Pera” sauce, adding meat (or liver) sausage, a bit of PrimoGrano INTOSSO monocultivar extra virgin olive oil and Pecorino cheese. 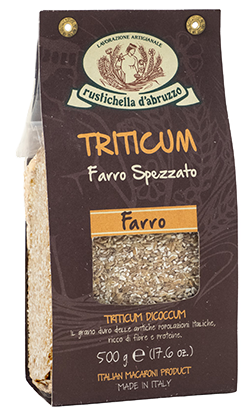 Our TRITICUM DICOCCUM Farro fields, controlled from the sowing to the harvest, are part of a controlled production chain, started with the project PrimoGrano in 2004, when the possibility of controlling cultivations from sowing was still under discussion in Abruzzo. Rustichella d’Abruzzo Farro Spezzato is versatile for preparing meals and can combine with our condiment “Panzanella” for instance, with capers and a bit of Rustichella Bio extra virgin olive oil, for a fresh starter or summer light meal, used with slightly cooked prawns to stuff squids, or as main ingredient for some vegetable soups. Our TRITICUM DICOCCUM Farro fields, controlled from the sowing to the harvest, are part of a controlled production chain, started with the project PrimoGrano in 2004, when the possibility of controlling cultivations from sowing was still under discussion in Abruzzo. Farro Intero is perfect for summer salads with cherry tomatoes, capers, slivers of Parmigiano cheese, perfumed basil, Bufala mozzarella and Rustichella PrimoGrano INTOSSO monocultivar extra virgin olive oil. Also, it is good for fresh and tasty starters or as fresh vegetable-based main course with a bit of Rustichella PrimoGrano INTOSSO monocultivar extra virgin olive oil.